The spirit of Christmas will be captured on Sunday 16 December, when Manx National Heritage hosts its annual Christmas Concert at the Manx Museum. Themed the ‘Good Old Days’, the concert offers an excellent entertainment line-up, with guest performers including Lon Dhoo Male Voice Choir supported by Val Kissack, Perree Bane, Dance Dynamics and Ellan Vannin Pipes and Drums. “Our Christmas Concert is a popular annual event at the Manx Museum. Each year, the concerts links to the exhibitions we have on display at the museum, with the upcoming concert coinciding with ‘That’s Entertainment, an exhibition focusing on entertainment in the holiday heydays on the Isle of Man”. In addition to musical entertainment and dance acts, the concert includes a magic show by Juan Corrin, Magician of Mann. There will also be appearances by Val Doonican and George Formby lookalikes, in addition to festive monologues by special guests. “Our team are very much looking forward to staging this year’s concert, which promises to provide a heavy dose of laughter. Guests are encouraged to arrive ready to sing along, and if desired, dress for the occasion in any style they wish from the ‘Good Old Days’ ”. The concert takes place from 2pm to 4pm on Saturday 16 December at the Manx Museum and includes a half hour interval for tea, biscuits and festive shopping. Tickets cost £10, available from the Manx Museum Shop and www.manxnationalheritage.im/shop. 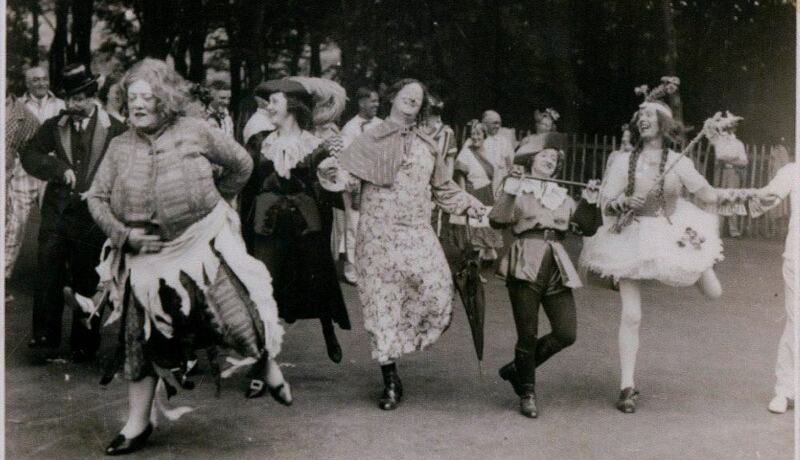 Image caption: ‘The Good Old Days’ – Florrie Forde and Eva Kane (with Billy Danvers, Gracie West and Ethel Revnell) in a scene from an open-air pantomime of a play at the Falcon Cliff Hotel, 1938.